Float Tube Fishing. Enjoy your fishing (Lake Aniwhenua, in New Zealand’s North Island. They come in a variety of colours and shapes, but all provide the same opportunity – to sit in the comfort of an armchair while sneaking up on those wily old trout at your favourite spot! What are they? A float tube, of course. These ﬂoating, inﬂatable “armchairs” have been around for quite a while now, probably originating in the USA. More recently, the idea has been extended to produce “ﬂoat boats”, which are generally twin-hulled affairs with seats above water and the ability to be rowed or even propelled by small outboards. I’ll not discuss these craft further in this article, but they do have a place in the armchair fishing scene. What is a float tube? ln the simplest sense, a ﬂoat tube is an inner tube of an appropriate size to keep a person aﬂoat, with a seat of some form suspended from it. The general idea is that the fisher sits inside the tube, with the surface of the water at about waist level, and propels himself or herself with the aid of swim fins or ﬂippers. Modem ﬂoat tubes have fabric covers which house the inner tube or bladder and provide pouches for secondary ﬂoatation, spare clothing, tackle and refreshments. The seat is usually attached to this cover and often has a webbing strap which clips onto the main tube to stop the fisher slipping into the water! Commonly, the secondary ﬂoatation consists of a smaller inner tube or bladder in a pouch which forms a backrest for the fisher. If the main tube deﬂates, this secondary buoyancy should keep the ﬁsher aﬂoat until rescue arrives or the shallows are reached. Under normal circumstances, the backrest provides comfort, support and protection from waves which would otherwise splash over the rear and dribble down your back! A “doughnut” style float tube. On some ﬂoat tubes, the backrest also may have a storage compartment large enough to hold shoes and a waterproof jacket. The gear pouches will vary in number and placement, depending on the type of ﬂoat tube, but usually provide storage on both sides of the tube, in easy reach of the fisher. Here one can store those ﬂy boxes, spare reels, spools of tippet material, camera (preferably waterproof, refreshments and whatever. Lastly, most ﬂoat tubes have a “stripping apron” for keeping the ﬂyline and other bits and pieces from falling into the water. There it is, the complete fisher’s armchair! Two basic designs of ﬂoat tubes are available, either known as “doughnuts” or “u-boats”. The original “doughnut” is based on a truck inner tube and is more-or-less circular in shape. These ﬂoat tubes are generally the lowest cost option and are very good. They are comfortable and stable, but getting in or out of them requires a bit of technique. l use a “doughnut” tube and have no problem getting in and out after a wee bit of practice. Having truck inner tubes as the main buoyancy, they are quite tough and can be easily repaired if a stray thorn or hook happens along. I have been told that inner tubes are not designed to be continually inﬂated and deﬂated, so keeping these tubes inﬂated, at least partially, will provide longer tube life. Because these tubes have standard automotive valves on them, they can’t be inﬂated by mouth or with the simple “air bed” pumps. No problem, because heaps of types of foot and hand pumps for car tyres are available cheaply and do the job well. If you’re not keen on working up a bit of warmth before ﬁshing, then you can buy electric pumps that plug into your car’s cigarette lighter socket and will pump away while you get kitted up and enjoy your coffee or tea before ﬁshing! The U-shaped tubes are generally more expensive, but will often have more storage pockets and be a bit lighter in weight. If you want to backpack your tube into a remote lake, the lighter weight could make these the best buy for you. The open front of this design makes getting in and out of these quite easy. A downside, though, is that they tend to be a bit saggy and uncomfortable if not inﬂated to the recommended maximum of about 5 psi. They will have inﬂatable bladders of a polyurethane material, specially made to fit the outer fabric of the ﬂoat tube. These bladders can usually be inﬂated by mouth (if you have a chest like Mr Universe!) or by the simple “air bed” hand or foot pumps which can be bought from most camping and outdoors shops. These tubes do not stretch like inner tubes and seem to tolerate being inﬂated and deﬂated regularly. They are not as tough as inner tubes, and patching them requires special glue and patch material which is usually provided with your purchase. A word of mild caution is needed on the matter of inner tubes and bladders when travelling. If your tube is inﬂated and you are going to travel, remember that the pressure inside the tube will increase relative to that outside as you go to higher ground. Increasing altitude can result in the bladder or inner tube bursting, although this is less likely with the stretchy nature of a truck tube. Remember also that increasing temperature will raise the pressure in the inner tube or bladder, so partially deﬂate your tube if it will be in the sun or another spot much warmer than when it was inﬂated. What beneﬁts does a float tube offer? 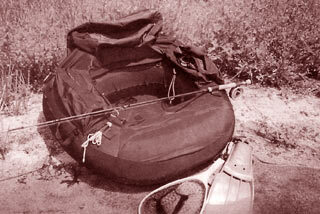 Apart from armchair-like comfort while you fish, a ﬂoat tube offers quite a few advantages. Float tubes are relatively cheap, with standard models starting at about $295 complete (but not including waders, fins and other, accessories). They are very portable and easily fit into the boot of a sedan car when deﬂated. They also can be back-packed easily into high country lakes. Fully inﬂated and ready to fish, my tube fits into the back of my station waggon. They can be launched and landed almost anywhere on a lake shore, so they give the fisher the ability to reach otherwise inaccessible spots and to cover a great deal of water. Many fish have been taken while trolling a fly as one moves from spot to spot! Your profile is low when seated in a ﬂoat tube and this allows you to be as inconspicuous (to the trout) as a duck on the pond. 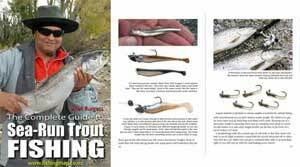 Being low on the water and quiet, with no splashy oars and creaky row-locks, you can sneak over and along weed beds, or into the shallows, to stalk those spooky trout feeding in these prime locations. 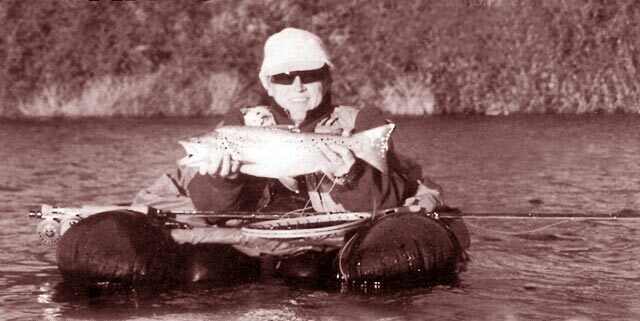 While l have mainly spoken about ﬂy fishing from a ﬂoat tube, I can see no reason why spinning and jigging also should not be successful from your ﬂoat tube. ln the USA, l believe that the duck hunters use ﬂoat tubes too, so that’s another opportunity to explore, with caution! What other bits of gear will you need? I mentioned before that the seat on the ﬂoat tube is below the water, so a good pair of chest waders is a must. In our lakes, neoprene waders provide the warmth to keep a fisher comfortably on the water for many hours. 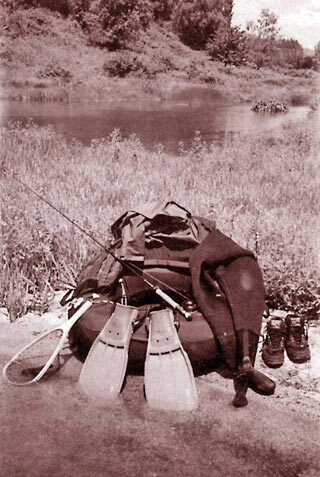 Other types of chest waders are fine if suitable clothing is worn underneath the waders to provide insulation from the cold water. Although boot-foot waders will do the job, they are not as comfortable as sock-foot waders when wearing the swim fins which are needed for propulsion. Boot-foot waders do have an advantage if the fisher wishes to visit dry land for any reason. One simply gets out of the ﬂoat tube and is ready to go, whereas, with sock-foot waders, a stop to put on the wading boots is needed. If you choose to go with boot-foot waders, special float tube fins are available to fit over the boot with relative ease. ln the case of sock-foot waders, l use my diving fins and get double the value out of them! Another item which is very useful is a ﬂoating landing net. Attached to the ﬂoat tube by a length of cord, this simply ﬂoats along with you until needed. Wooden-framed landing nets are available in many shapes and sizes and you should choose one which will cope with the size of fish you are likely to catch – be optimistic! Small anchors suitable for ﬂoat tubes are available. These are generally small folding grapnels, and apparently, do the job of keeping the ﬂoat tube in the chosen spot while you concentrate on fishing. I don’t use an anchor because l prefer to be free to drift and move, even if it does mean that l have to paddle against the wind to stay in my “hot spot”. All the other items will probably be in a ﬂyfisher’s bag already. Polarising sunglasses and a hat to keep the sun off the face are useful. A good pair of forceps for removing hooks when you need to release a fish also help. Some manufacturers also make fish bags to attach to the ﬂoat tube and these can be useful, al- though killing a fish quickly and then threading a short length of cord through the gills can do the job adequately. Float tubes are designed for use in still water only and should not be used in ﬂowing water. Most tubes will carry warnings to this effect, but it is worth stressing this point. ln ﬂowing water, a tuber can get into uncomfortable situations and you should, therefore, avoid them! I mentioned before that ﬂoat tubes usually have secondary ﬂoatation to provide a safety factor in the case of an emergency. Personally, l would not use a ﬂoat tube without this and stress that the secondary buoyancy must be inﬂated! While accidents involving ﬂoat tubes have been few, they have happened. It is also recommended that a personal floatation jacket is worn while tubing. The automatically inﬂating types are ideal since they are comfortable to wear. A key point to remember is that, just like kids’ inﬂatable toys, your tube will deﬂate if some nasty sharp object pierces the inner tube or bladder. It pays to be just a wee bit careful when working with a knife or hooks in a ﬂoat tube! As with most emergency situations, remaining calm and avoiding panic can often prevent a disaster. If your ﬂoat tube suddenly deﬂates, your reserve buoyancy should be enough to keep you safely aﬂoat, provided there is no panic. Using this buoyancy and your personal ﬂoatation jacket, you should be able to reach the shore without suffering anything worse than getting wet! Your only means of propulsion in a ﬂoat tube is your swim fins, so if they fall off, the situation could become embarrassing! Making sure that your fins are on properly is a good idea, and it can also be useful to use one of the devices available to secure your ﬁns to your ankles so that they can’t be lost. If we think about the shape of a ﬂoat tube, it isn’t the most streamlined or slippery shape, either through the water or the air. If a strong wind blows up, the job of propelling the tube against the wind can take lots of puff. Be warned that good judgement is necessary when deciding whether or not to use your ﬂoat tube if the wind is strong, particularly on larger lakes. If you do get caught out by a sudden blow, you should be able to reach the downwind shore and either wait it out or pack up and walk back to your base. Remember that your profile in a ﬂoat tube is low and that you will be less visible to other water trafﬁc than perhaps a dinghy or canoe might be. For this reason, it makes sense to wear a brightly- coloured hat or jacket when ﬁshing from your ﬂoat tube and to stay aware of boats that are nearby. Many ﬂoat tubes also have orange or yellow material on the rear of the backrest which makes the ﬂoat tube more visible. l mentioned before that a benefit of fishing from a ﬂoat tube is your low profile, and hence less of you being visible to the trout. This low proﬁle has another effect, though, and this is to put your ﬂy-casting loop closer to the water than if you were standing. For this reason, short ﬂy rods don’t work well from a ﬂoat tube, so I’d recommend the standard 9-foot rod for the average caster. Getting in and out of your ﬂoat tube can provide much amusement for onlookers if you don’t have a few tricks up your sleeve! Firstly, don’t try to walk even a short distance to the water while “wearing” your ﬂoat tube! Carry your rod, fins and ﬂoat tube to the water’s edge, choosing a place where you can enter the water easily. Put your fins on and enter the water, no more than calf-deep. Make sure that your rod is placed on the bank where you can reach it, then get into your ﬂoat tube. If you have a “doughnut” tube, it is easy to lift it over your head and lower it over your shoulders until it is ﬂoating. Grab your rod and walk slowly (backwards is easiest while wearing fins) until deep enough to sit in the tube. Remember to fasten the harness which will prevent you slipping forward on the seat, before paddling away to a great day of fishing! Getting out of your tube is easier, but a wet ﬂoat tube lifted over the head can make for discomfort, so just get into the shallows, unbuckle the harness, remove your fins, and step out of the ﬂoat tube. It should be easy! So, if you aren’t already enjoying “armchair” fishing, get a ﬂoat tube and enjoy yourself!